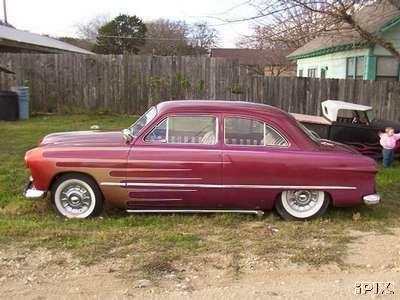 Mild Custom 1949 Ford 2 door sedan with a Merc flathead and automatic transmission. This is an older custom that was previously owned by Tony Grato of Dallas who did the scalloped paint/clear coat and body work. It was nosed, decked, shaved and smoothed with frenched headlights and taillights. The interior is OK, it is maroon and white tuck and roll with new headliner. The dash is in excellent condition with traditional pin striping. All the knobs are there and they all work. All the lights on the car work, including the interior. The skirts are also included and are currently in the trunk. It also has '57 Cadillac bullet hubcaps and older wide white wall bias ply tires. This car could use some freshening up, the paint has some chips and the clear is peeling in some areas. The motor has a miss and could probably use a tune-up because it has been sitting for the last few years.